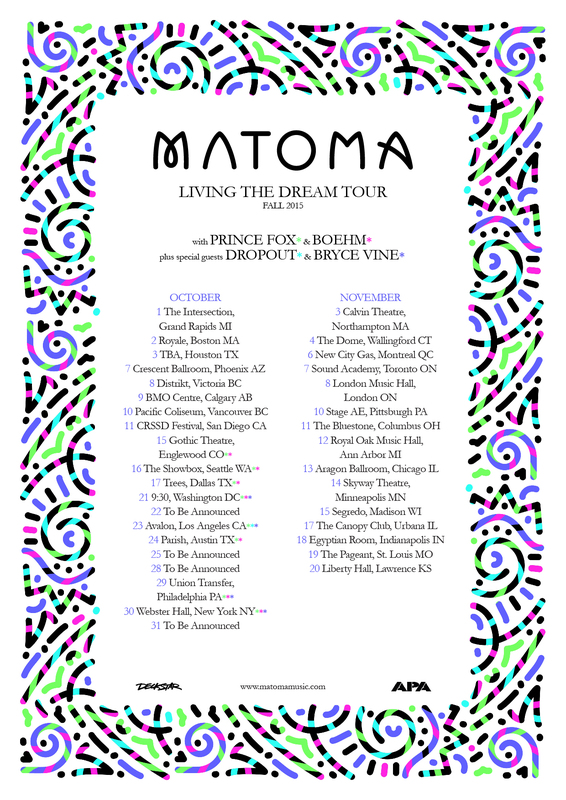 Huge news for Matoma, Remix, and EDM fans: Announced Wednesday August 18 –– Matoma schedules tour spanning over 30 cities this October and November! See official press release below… Presale tickets available NOW! New York, NY – August 18, 2015 – Norwegian DJ/Producer Matoma who released his mega hit single Matoma & The Notorious B.I.G. “Old Thing Back” (feat. Ja Rule and Ralph Tresvant) on Big Beat, is excited to announce that he will be kicking off his highly anticipated Living The Dream this Fall exclusively over on BILLBOARD. The 30+ city tour kicks off on October 1st in Grand Rapids, Michigan at The Intersection and will feature their good friends Prince Fox & Boehm throughout the dates, as well as special guests Dropout & Bryce VIne. Fan pre-sale tickets went up at Noon EST today and can be purchased HERE. Please see full tour routing below! Matoma is also gearing up for his New York performance at the Billboard Hot 100 Music Festival this weekend Sunday August 23rd at Jones Beach, and TomorrowWorld in Atlanta, GA on September 27th. Posted in Features, House, Tynan FriendTagged fire, matoma, music, tourBookmark the permalink.